Based on the industry-leading CSR1010 from CSR, these new modules extend CEL’s technology reach into the rapidly growing Bluetooth Low Energy market. The B1010 supports CSRmesh™ as well as CEL’s award-winning MeshWorks™ platform. 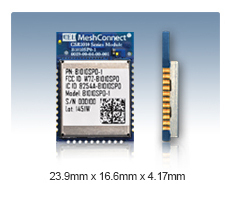 CEL also offers a version of the module which comes pre-loaded with the Powered by Avi-on firmware running on the CSRmesh protocol.